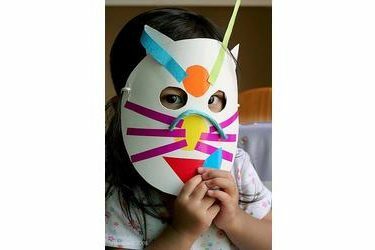 Baker Arts Center’s September ARTStart Preschool workshop for ages 3-5 features small artist’s making masks to “Peek” through. Their simple mask creations will be made from folded paper, markers, crayons, scissors, and cardstock. The Listen and Move tape along with handkerchief juggling allow for creative movement activities. This class meets on Wednesdays, September 3, 10, 17, 24 from 10:00 to 11:00 am. The cost is $15.00 for members and $20.00 for nonmembers. Class size is limited. Please call 620-624-2810 for more information and to enroll. The center is located at 624 N. Pershing in Liberal. The magic of Mask Making will transform the appearance of young artists as they try on their creations. Pre-made commercial molds and plaster gauze, preformed paper mache base forms, along with paint, colored paper, tissue, cardboard, feathers, sparkling gems, and other found objects in combination are some of the materials to give life to the masks. This class will meet on Wednesdays, September 3, 10, 17, 24 from 3:45 to 4:45 pm. The cost is $15.00 for members and $20.00 for nonmembers. Class size is limited. Please call 620-624-2810 for more information and to enroll.